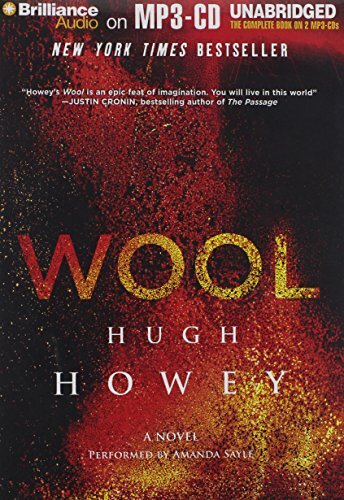 Amazon.com description: Product Description: Ã¢ÂÂWool is frightening, fascinating, and addictive. In one word, terrific.Ã¢ÂÂ Ã¢ÂÂ Kathy Reichs, author of the Temperance Brennan and Tory Brennan series In a ruined and toxic landscape, a community exists in a giant silo underground, hundreds of stories deep. There, men and women live in a society full of regulations they believe are meant to protect them. Sheriff Holston, who has unwaveringly upheld the siloÃ¢ÂÂs rules for years, unexpectedly breaks the greatest taboo of all: He asks to go outside. His fateful decision unleashes a drastic series of events. An unlikely candidate is appointed to replace him: Juliette, a mechanic with no training in law, whose special knack is fixing machines. Now Juliette is about to be entrusted with fixing her silo, and she will soon learn just how badly her world is broken. The silo is about to confront what its history has only hinted about and its inhabitants have never dared to whisper. Uprising.